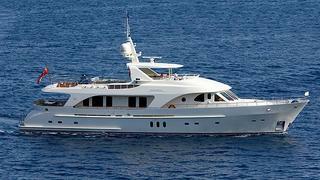 A call to Robert Drontmann at Moonen Brokerage confirms that he acted for the seller in the sale of the 30m motor yacht Darsea. Darsea was launched in 2008 as the first in a highly successful custom-series of Moonen 97 displacement cruisers. She features handsome lines from René van der Velden and an open interior from Art-Line accommodates eight guests in a master suite, VIP stateroom and two twin cabins. Twin 600hp Caterpillar engines give her a range of 4,0000 nautical miles. Darsea was asking €6.9 million.